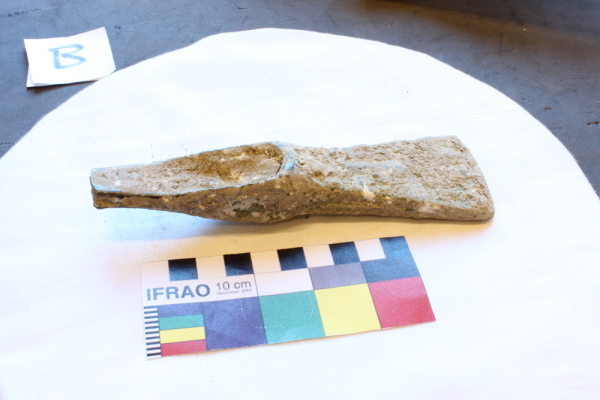 Our penultimate Bronze Age Index project focuses on Bronze Age swords from the River Thames. Finds from the Thames and other watery locations in Britain and Northern Europe have fascinated scholars for many years, and recent excavations at Must Farm and Flag Fen show the incredible importance of riverine environments to prehistoric peoples. In a sense, Thames finds have been central to the study of later prehistoric Europe over the last hundred years, and there have been a huge amount of studies (see references below) dedicated to the topic, in particular on the increasing deposition of weapons (spearheads, dirks, rapiers, swords) from the Middle Bronze Age onwards (Bradley 1990: 99, 108-109). The idea of depositing weapons in water very much resonates with our popular cultural history. 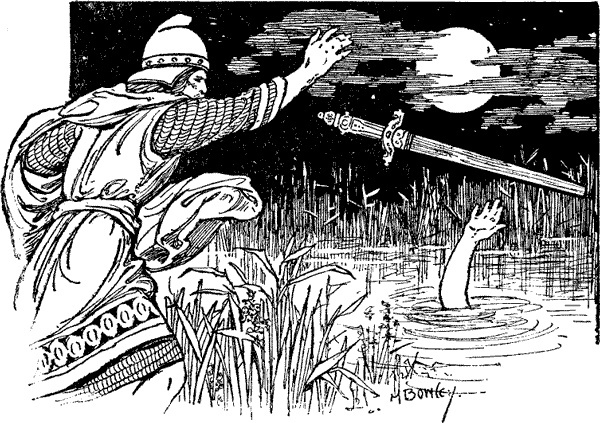 Folk stories and myths of a legendary past often feature the act of throwing costly and beautiful items into the water as both a sacrifice and an offering, most famously depicted in the story of King Arthur’s magical sword Excalibur being returned to the Lady of the Lake (illustrated above), with these stories possibly reflecting echoes of ancient practices. The River Thames was famously described as ‘Liquid history’ by the 19th century MP John Burns, and its importance cannot be underestimated as both a natural boundary and, perhaps, the ‘longest archaeological site’ in the UK (York 2002, Cohen 2010). What can the Bronze Age Index (BAI) tells us about Bronze Age metalwork deposition in the River Thames and the collection history of this material? 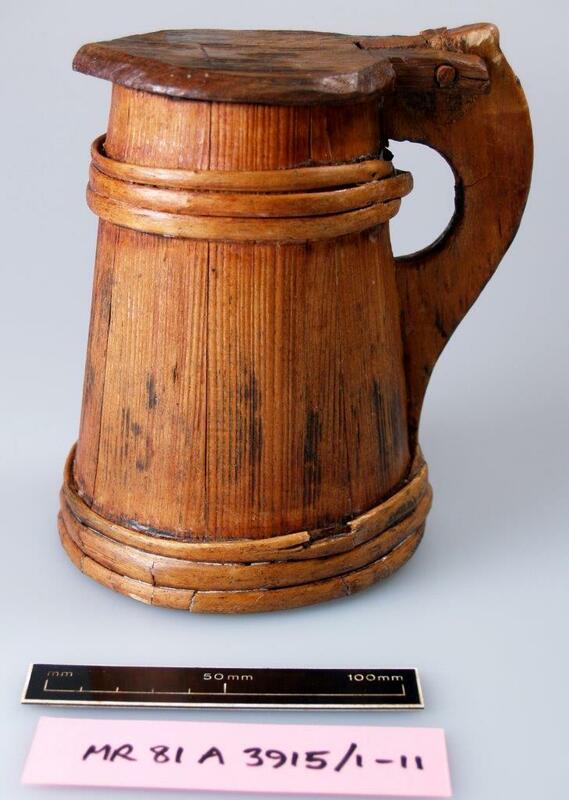 We have over 1,200 records of artefacts connected to the Thames recorded in the Index. 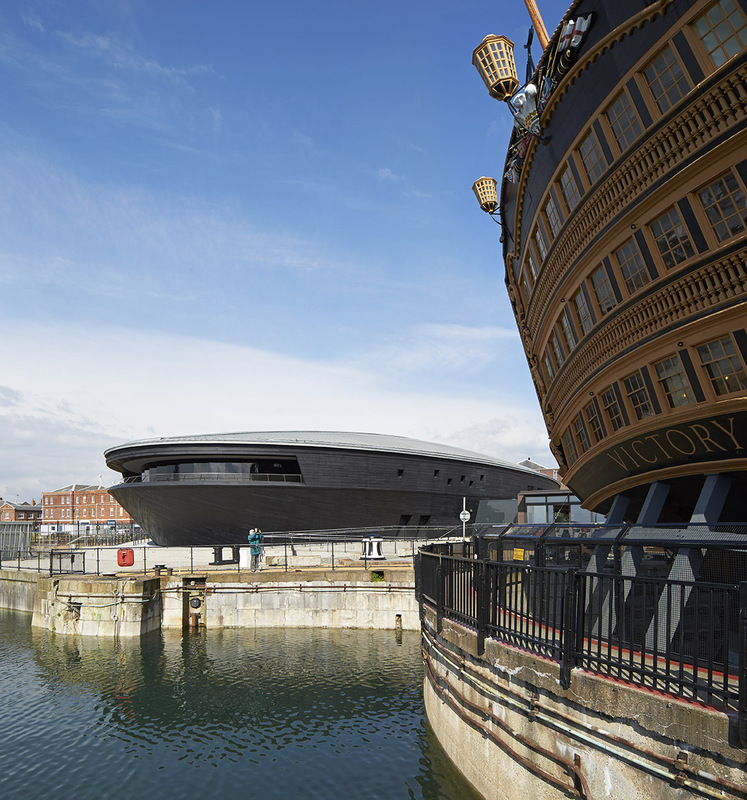 Largely it is an antiquarian collection relating to the numerous artefacts recovered from the Thames during the 19th and early 20th century, which were often found by workmen in the course of dredging and the building of bridges and locks. 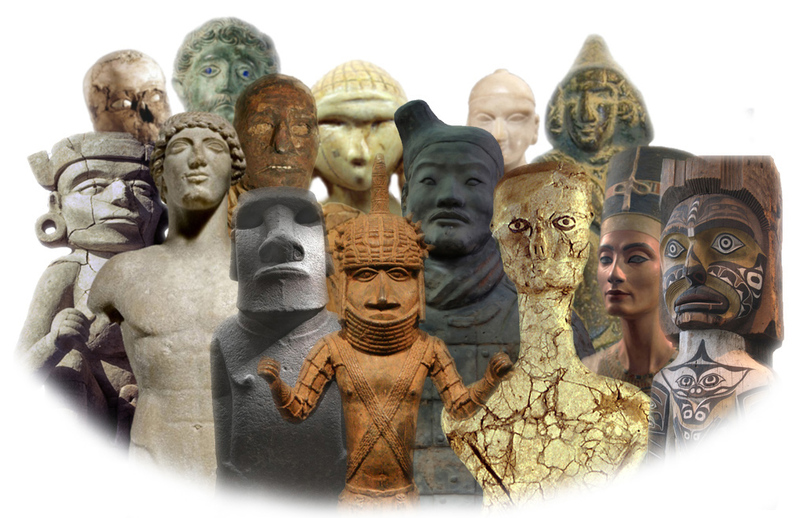 Many of these objects were acquired by private collectors, who often paid handsomely for high quality display pieces but rarely recorded the exact find spots and circumstances of recovery (Cowie & Eastmond 1997: 88). Examples of BAI cards recording River Thames finds ©Trustees of the British Museum. Private collections, which are especially important as these might not be recorded anywhere else. Pre-PAS metal-detecting finds, which also might not be recorded anywhere else. Metal-detecting is now closely controlled along Thames foreshore, so these older records might give offer us some key insights into the foreshore record. Many of the cards contain unique and extensive data about the artefact’s record, which in some cases indicates that its provenance to be connected to another find spot based-on dredging activity. We are still digitising and going through the records, but I wanted to go through some of the preliminary patterns we see in the Index records. 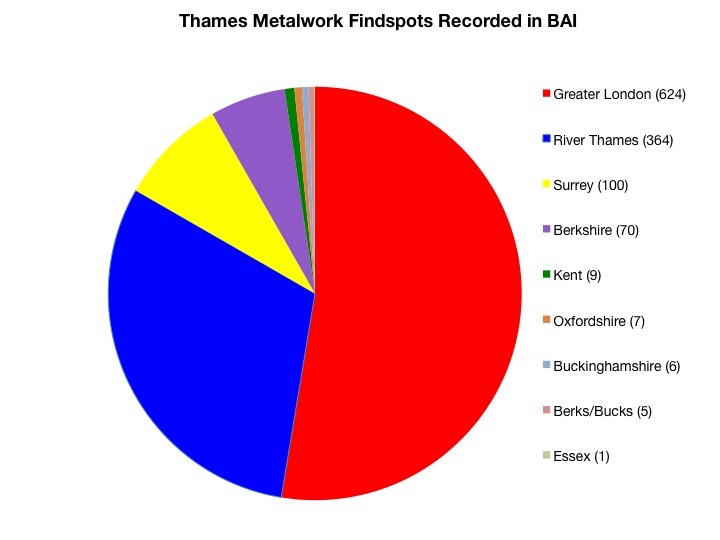 The pie chart above shows the regional distribution of Thames metalwork find spots recorded in the Index. As we can see, Greater London by far represents the largest number of records. Most of these records would be connected to the significant dredging works undertaken between 1895 and 1900 (Port of London Authority). A second capital dredging campaign concluded by 1928, during which some 37 million cubic yards were excavated. There are a number of unprovenanced sites recorded as simply coming from the ‘River Thames’ without exact find spots, though related information seems to indicate that most of the artefacts would have come from London in connection again to dredging and bridge building activities. We have smaller but significant groups of records from Berkshire and Surrey as well, many of these coming from the Thames Water Collection collected by Thames Conservancy Board during dredging of the non-tidal part of the river up the Teddington Lock and donated to the Reading Museum in 1996. 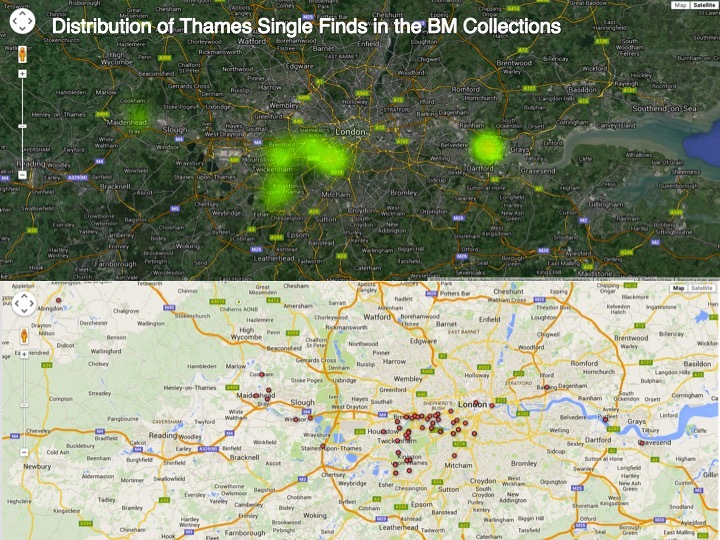 Looking at a smaller sub-set of data of 249 records of Thames Single Finds in the British Museum’s Collections, we can see in the map (above) that the general distribution of find spots with clusters in London (especially West London), London Docklands (representing the general ‘River Thames’ finds), and Maidenhead/Bray in Berkshire. Looking closer at the London find spots represented in this data, after unprovenanced ‘River Thames’ finds, we have highest concentration of finds coming from Battersea and the Richmond and Wandsworth districts of West London. David Field (1989) famously commented that the “collections of prehistoric artefacts from the river in west London represents one of the most impressive concentrations of archaeological material in the British Isles”. Finds seem to cluster especially around Kingston Bridge, Wandsworth Reach, Hammersmith, Isleworth, Putney, Chiswick, Teddington, Twickenham, and Barnes, with many important sites represented in the records. 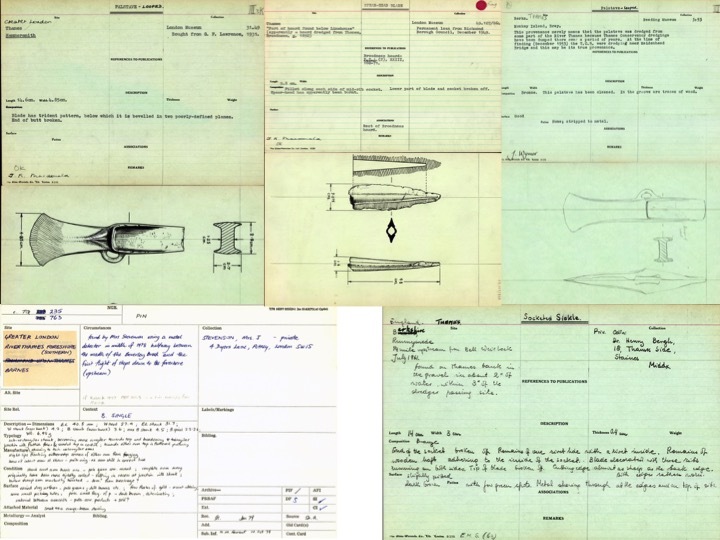 Index cards recording small finds from Ivor Noel Hume’s 1955 excavation at Syon Reach ©Trustees of the British Museum. 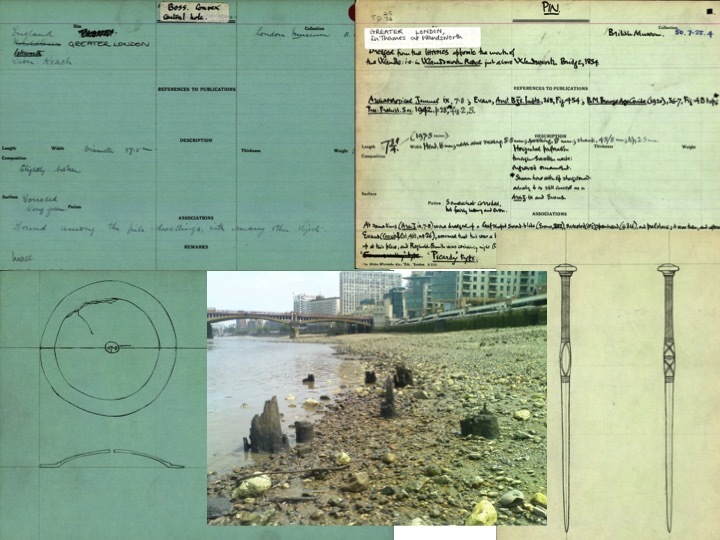 Many cards feature small finds and ornaments, as shown here, recording Ivor Noel Hume’s 1955 excavation of Late Bronze Age timber & wattle platform at Syon Reach near Isleworth, Richmond, which was unfortunately washed-away by a passing ‘pleasure boat’ while they were in the process of recording it! The Thames Discovery Programme have recorded ‘a significant concentration of Bronze Age material, (possibly representing a trading centre or deliberate votive deposition)’ at Isleworth, possibly in some resemblance to the Vauxhall ‘bridge’ structure dated to the Middle Bronze Age. Many records are also connected to the tributaries of the Thames, and particular concentration from the ‘mouth of the River Wandle’ just above Wandsworth Reach/Bridge. 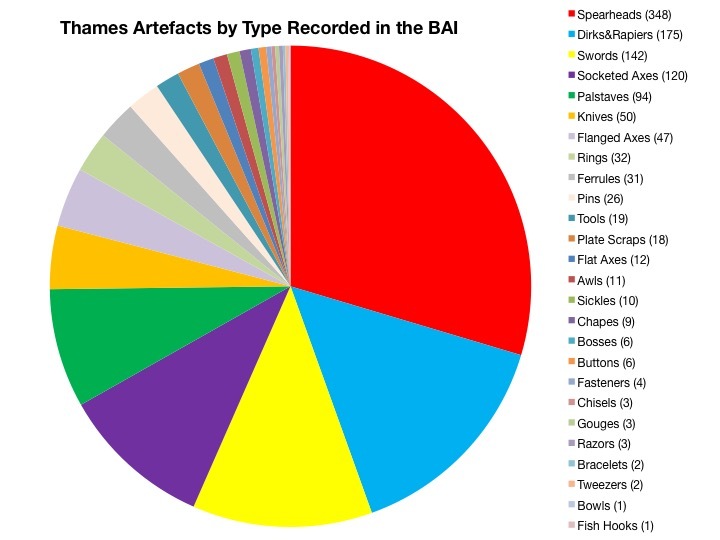 Looking more closely at artefacts recorded in the Index, we have 26 categories of artefact types from the Thames that are so far represented in the Index, as shown here. At the moment we have many more spearheads than anything else, but dirks & rapiers, swords, socketed axes, palstaves, and knives all figure prominently. This pattern is repeated throughout studies of Thames material, with not only a massive record of weapons found in the Thames from the MBA onwards but the concentrations of sword deposition (pictured below) by the LBA clustering in the Thames Valley and Fenland of East Anglia, with relatively few deposited north of the Severn-Wash line. Map ©N. Wilkin after Colquhoun & Burgess 1988. How is this material being treated? York’s excellent 2002 study looked at both Index and published records in order to reassess the lifecycle and destruction of metalwork from the non-tidal Thames upstream of Teddington. She notes that in conjunction with the rise in weapon deposition there is also an increase in object destruction from the Penard (late MBA) to Wilburton phase (early LBA). Spearheads and swords were being treated differently than other objects deposited in the Thames, with destruction levels increasing over time, and it is clear that Bronze Age communities were perceiving these objects in a new and special light (York 2002: 88-89). Deposition may have been related to a display of wealth, social status, territory, celebratory after battle, or part of a burial or community ritual (for further discussion, see Bradley 1990). 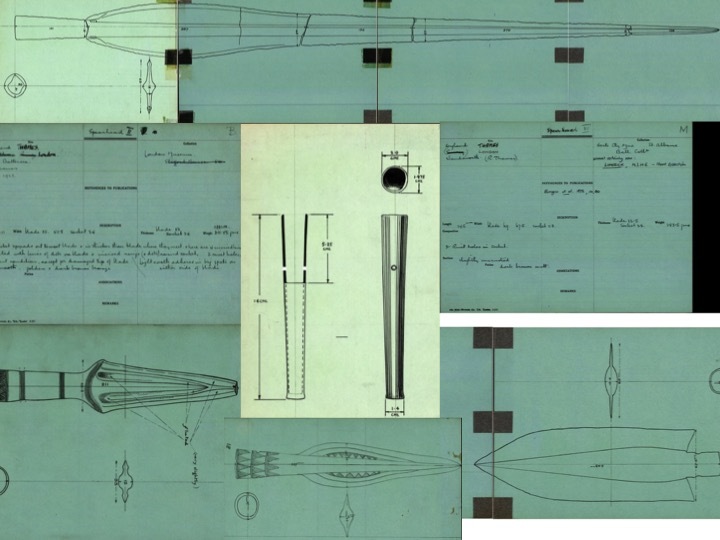 Examples of Thames spearheads in the Index ©Trustees of the British Museum. We do not know for certain, unfortunately, the complete significance that throwing these special objects into significant bodies of water may have held for prehistoric peoples, we can only see their impact on the archaeological record and our understanding of the past. Hopefully, further research on this major resource will bring to light more information about these wonders from the deep. 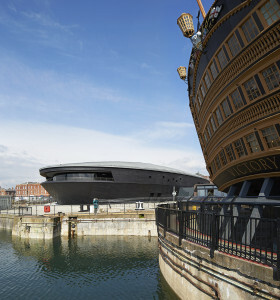 In particular it would be key to connect this data to other museum’s collections & archives, especially the Museum of London’s extensive London Archaeological Archive & Research Centre (LAARC) (which also has a complimentary antiquarian records related to Thames finds). 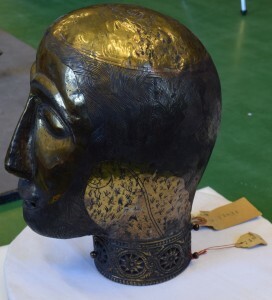 Additionally a long-term goal would be to better integrate this data into the Greater London Sites and Monuments Record & other regional HERS, and look further at the connections between sites and objects recorded previously under the Thames Archaeological Survey, & currently by the Thames Discovery Programme. This blog was based on a paper I presented on 20th April 2015 at the Tales the River Tells: Later Prehistoric Finds from In and Around the Thames Conference run by the Prehistoric Society and the Later Prehistoric Finds Group. Many thanks to Michael Marshall (Museum of London Archaeology) and Courtney Nimura (University of Oxford) for inviting me to speak at the conference. BRADLEY, R. 1990: The Passage of Arms (Cambridge University Press). BRADLEY, R. and GORDON, K. 1988: Human skulls from the River Thames, their dating and significance. Antiquity 62, 503–9. COLQUHOUN, I. and BURGESS, C. 1988: The swords of Britain. Prähistorische Bronzefunde IV.5. Munich: Beck. COTTON, J. 1999: Ballast-Heavers and Battle-Axes: The ‘Golden Age’ of Thames Finds. In Coles, A. and Dion, M. (eds. ), Mark Dion: Archaeology (Black Dog Publishing), 58–71. COWIE, R. and EASTMOND, D. 1997: An archaeological survey of the foreshore in the Boroughof Richmond upon Thames. London Archaeologist 8 (4-5), 87-93, 115-121. EHRENBERG, M.R. 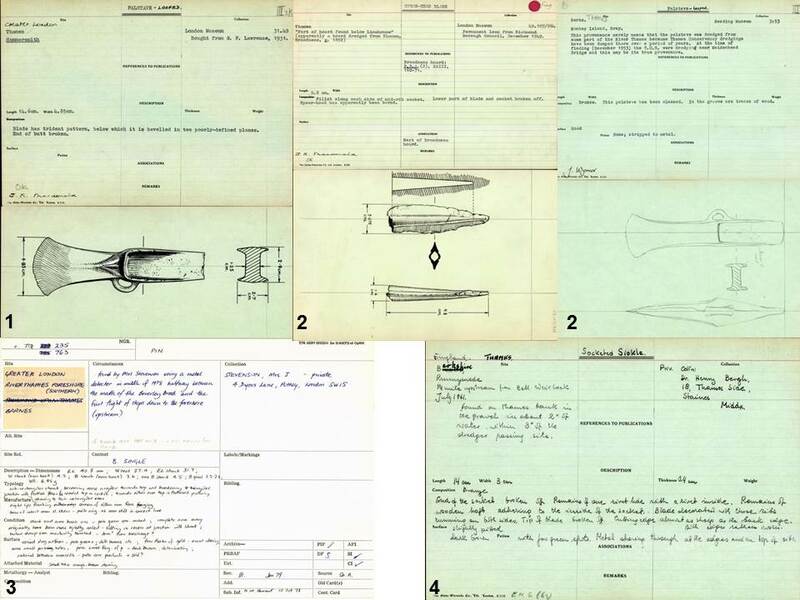 1977: Bronze Age Spearheads from Berkshire, Buckinghamshire and Oxfordshire (Oxford, BAR Brit. Ser. 34). 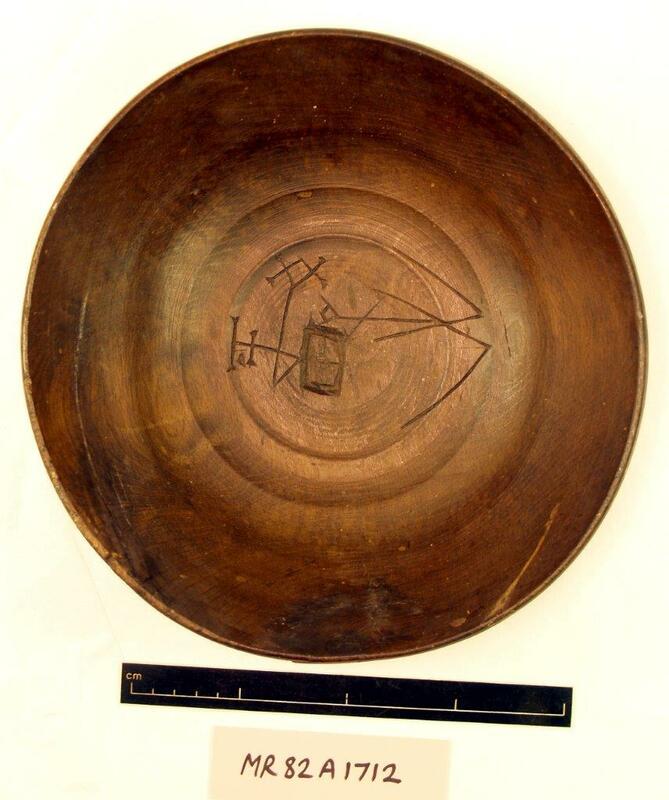 EHRENBERG, M. 1980: The Occurrence of Bronze Age Metalwork in the Thames: An Investigation. Transactions of the London and Middlesex Archaeological Society 31, 1–15. FIELD, D. 1989: Tranchet axes and Thames picks: Mesolithic core tools from the west London Thames. Trans London Middlesex Archaeol Soc 40, 18. NEEDHAM, S. 1988: Selective deposition in the British Early Bronze Age. World Archaeology 20(2), 229–48. NEEDHAM, S. and BURGESS, C. 1980: The later Bronze Age in the Lower Thames Valley: the Metalwork Evidence. In Barrett, J. and Bradley, R. (eds. 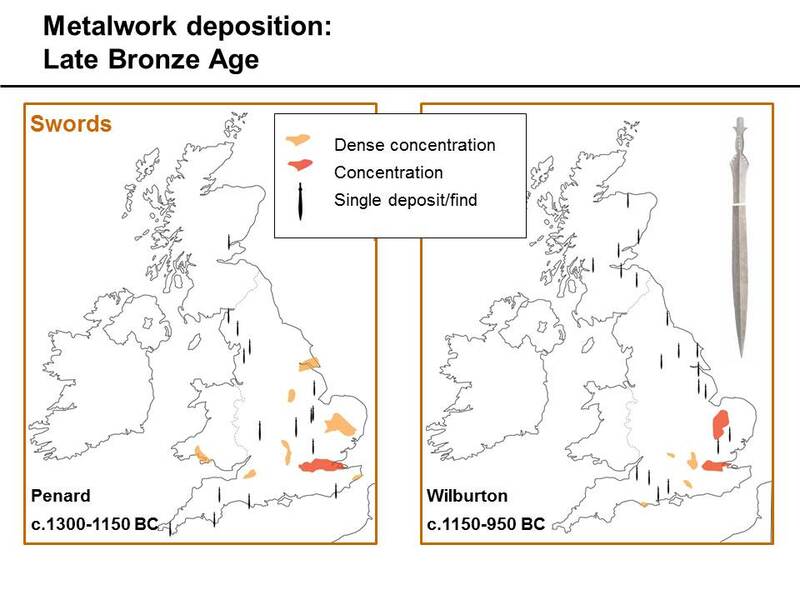 ), The British Later Bronze Age (Oxford, BAR Brit. Ser. 83 (i)), 437–70. O’CONNOR, B. 1980: Cross-Channel Relations in the Later Bronze Age (Oxford, BAR Int. Ser. 91 (i) and (ii)). PEARCE, S. 1984: Bronze Age Metalwork in Southern Britain (Princes Risborough). ROWLANDS, M.J. 1976: The Production and Distribution of Metalwork in the Middle Bronze Age in Southern Britain (Oxford, BAR 31). THOMAS, R. 1984: Bronze Age Metalwork from the Thames at Wallingford. Oxoniensia 49, 9–18. YORK, J. 2002: The Life Cycle of Bronze Metalwork from the Thames. Oxford Journal of Archaeology 21(2), 77-92. This September we were lucky enough to have a visit from a group of Egyptian scholars organised by the Egypt Exploration Society (http://ees.ac.uk/news/index/322.html). The Egypt Exploration Society (EES) has been one of main crowd-sourcing collaborators, asking MicroPasts’ contributors to transcribe early 20th century excavation records from Amarna West and Amara, and we have now done 18 crowd-sourcing projects together with over 20,000 tasks completed! The Egyptian scholars were based at the EES’s London office for six weeks conducting research and training relevant to their research projects and working roles in Egypt, and in conjunction we ran a series of training sessions with them on crowd-sourcing, GIS, and 3D photography at the Institute of Archaeology, UCL and the Department of Britain, Europe, & Prehistory (BEP), British Museum. 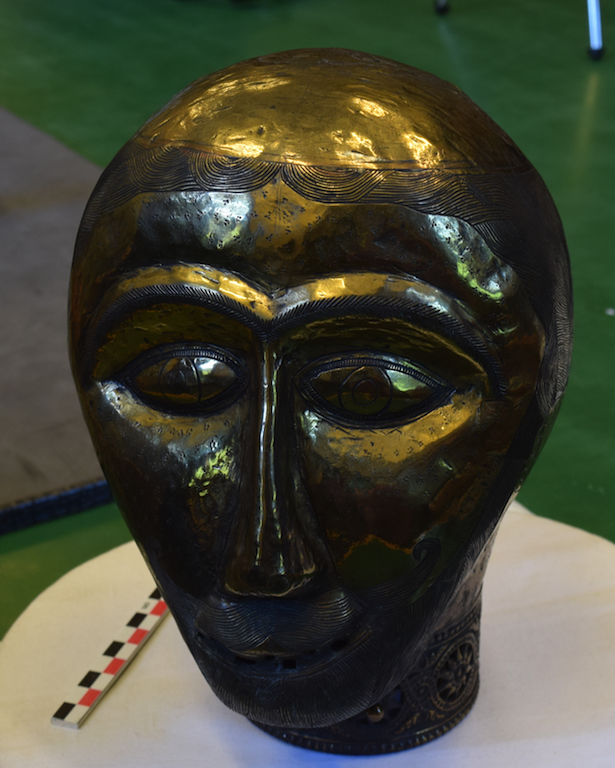 We thought we might be interesting to photograph this mysterious head with the Egyptian Scholars, in the hope to bring more attention to this fabulous object for further research. Help us make the 3D model here! Jennifer from the MicroPasts Team in conversation with Georgi Parpulov, Project Curator: Empires of Faith, Middle East Department, British Museum. Many thanks to the EES and the Egyptian scholars for their help with the project! Carefully-made drawings have been a fundamental way that archaeologists have recorded their finds since the dawn of archaeology as a formal academic subject at the end of the 19th century. As time has gone on, these drawings have become ever more technical in their style and standardised in their components. Sadly, this means there are fewer opportunities these days for archaeological illustrators to show off their personal artistry in making such drawings (here’s a great example). However, in contrast, this attention to standardisation means the archaeological drawings are now more easily compared to one another. A typical feature of archaeological artefact drawings today is the depiction of what an object looks like ‘in section’ or ‘in profile’. For something like a cup, bowl or storage jar, the drawing would show the thickness of the vessel body and the shape of its interior, (see below, figure 2a). Figure 1. Mediterranean amphoras: (left) one of the famous early typologies of amphoras by Heinrich Dressel and (right) some examples of amphoras from Pompeii. All of the above obsessions in archaeology come to a head for those who specialise in studying vessels such as ‘amphoras’ (figure 1). Virginia Grace was one of the early amphora researchers who best described the surprisingly wide range of advantages that this specialised pottery form offered for shipping liquid commodities such as olive oil and wine (amongst others) around the Mediterranean. To paraphrase and extend her comments, an amphora is a clay two-handled jar whose design is specialised for maritime transport. Its elongated, symmetrical shape could be fashioned on a potter’s wheel which facilitated the production of large numbers of regular shapes. The common choice of a pointed-base made many amphoras less vulnerable to breakage and allowed them to be stacked in multiple layers in the holds of Mediterranean ships (e.g. with the bases of one layer sitting in the space between the vessels below). They could also be placed individually in stands, arrayed in groups on racks, leant against one another on wharves and in warehouses, or half-buried on the beach whenever boats stopped in more isolated coastal locations. The design could also be carried in panniers, slung from ropes or hoisted onto the shoulder of a human porter, while an amphora’s narrow neck was perfect for sealing with a stopper and being rendered air-tight with a covering of clay or lime. The term amphora itself implies ‘two-handles’, and the combination of these two sturdy points of purchase, plus the pointed-base as a third, meant that these vessels could be easily carried by porters or controlled for pouring. It is no surprise therefore that amphoras have a really deep Mediterranean history stretching right back to at least the Middle Bronze Age (if not before) and continuing right into the Medieval period and despite rising competition from alternative transport forms such as the wooden barrel (more information on Mediterranean container history here). For over a hundred years, archaeologists have classified different amphoras into different types based on their overall shape, surface designs (if any) and type-of-clay and these typologies have been both useful both as a dating device and as a way of understanding possible changing transport priorities through time. 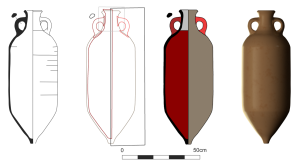 In the past, both producers (of amphoras and/or their liquid contents), merchants and consumers were obviously interested in knowing the volumetric capacity of an amphora (and standardising this where possible) so they were keen to standardise the shape and be able to calculate its capacity wherever possible. It was also tempting to produce eye-catching shapes and decoration that might signal the contents came from an exotic part of the Mediterranean and/or a particularly reputable source (just as there are efforts to brand olive oils and wines today via their containers and labelling). Or producers and distributors might wish to foster designs that were well-adapted for handling by dockside workers and for surviving the misfortunes of long-distance sea travel in a shiphold full of other cargo. Regardless, amphoras show some really interesting changes in design over their 3,000+ year-old history and these changes also match in interesting ways wider changes in the nature of the Mediterranean economy, big geo-political shifts such as the rise and fall of the Roman empire and so on. Figure 2. 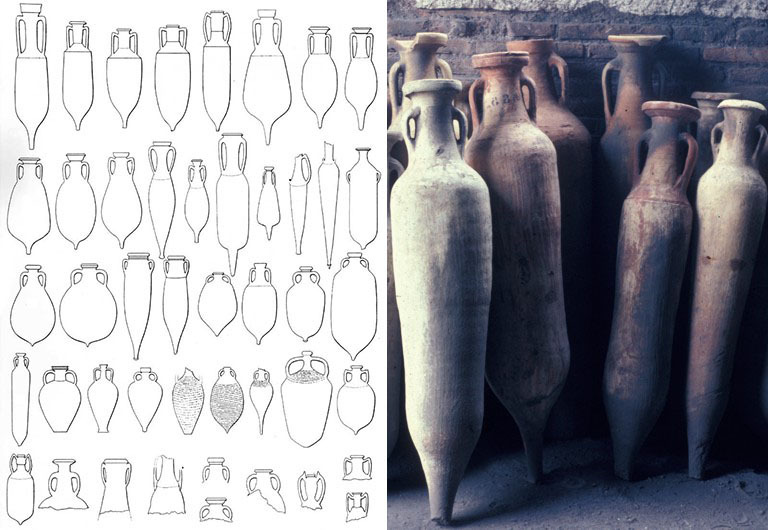 Four steps for building a crowd-sourced amphora model (left to right): the original line drawing, the crowd-sourced polygons with deliberate overlaps, the cleaned-up 2d polygons, and the final 3d model. In terms of measuring amphoras, people have tried a host of different methods. They have taken simple measures such as the amphora height or width, but also complex ones such as the amphora’s centre of gravity when full, or its overall capacity (how much it could hold). The latter measure of volume can be derived directly by filling an intact example of an amphora with seeds, water, sealed bags of liquid, beans or polystyrene beads (amongst others!) or it can be estimated mathematically. In fact, mathematical estimation of volumes (and other properties) for curves, conoids, spheroids etc. has been a domain of science and engineering actively researched since at least Hellenistic and Roman times, with major figures such as Archimedes, Apollonius of Perga and Hero of Alexandria working on the problem (with the suspicion that symmetrical real-world objects such as amphoras or jars were sometimes on their minds: for example, see here). 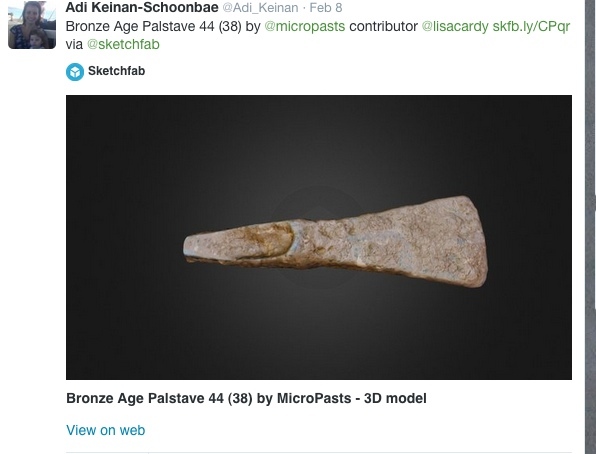 Computer-based methods for creating such a 3D ‘solid of revolution’ from a standard 2D archaeological line drawing have been around for at least couple of decades, but it is surprising that they have not been used more systematically. Through the help of many contributors on MicroPasts, we are therefore hoping to collect 2d and 3d models of much large numbers of container types so we can compare their shapes statistically, but also so we can explore other changing properties such as their volumetric capacity (how much they could hold and how consistent these measures are through time), centre of gravity when full or empty (important for how a human porter or a draft animal might handle them) or behaviour when stacked (e.g. where, and how frequently, they might break when bumping around in a ship’s hold). One of our current MicroPasts applications re-uses line drawings of amphoras made by Penny Copeland as part of a wonderful web resource about Roman amphoras developed by the University of Southampton and now maintained by the UK Archaeology Data Service. The goal is to enlist public help in digitising lines and polygons on top of the existing scanned drawings and thereby enabling both very good quality 2D and 3d models of these. Figure 2 shows an example of one of Penny’s original line drawings, as well as a crowd-sourced version, a clean 2d model derived from it, and finally 3d model (all using open source software and with some great help on the automated Blender part from Tom Haines: post-processing scripts here). 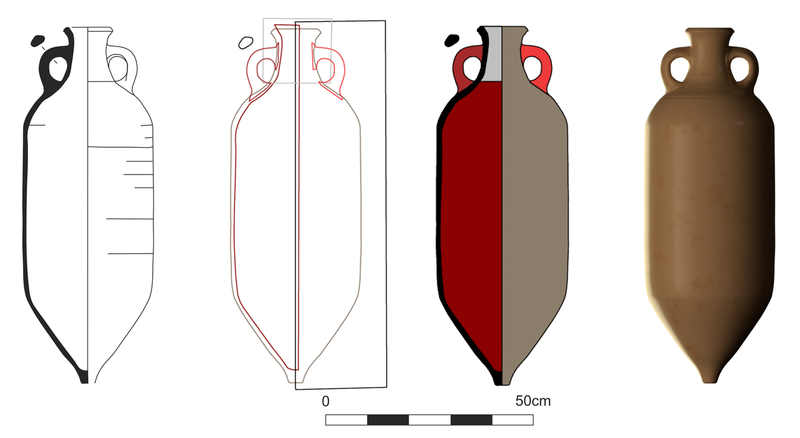 Once the crowd-sourced version is created the rest of the process is automatic and allows us to potentially compare a large number of amphora types. Hence, there are still plenty of important archaeological answers to be found in the amphoras and good reasons to enlist public help. If you have a spare moment, want to get some experience of GIS-style ‘vector digitising’ or just find these objects fascinating, then please lend a hand! The MicroPasts end of first phase funding conference will be held at the Royal Geographical Society on the 31st March 2015. We look forward to welcoming you and tickets can be purchased online or via contacting us directly. The conference programme has now been finalised and features some very interesting speakers as shown below. Lunch is provided in the ticket price and there will be some free things to take away (apart from the knowledge shared) and we hope to film the speakers. Many of the speakers are on Twitter (linked to their names below) and there maybe a lively back channel to accompany the event, which will be archived.